Today's "Pair It With"features books that are being marketed as perfect for fans of Eleanor & Park and The Fault in Our Stars. Say What You Will and Zac and Mia both feature two pairs of characters with medical issues who need one another. There are many electronic messages sent in both novels, and the covers just look so spectacular together. 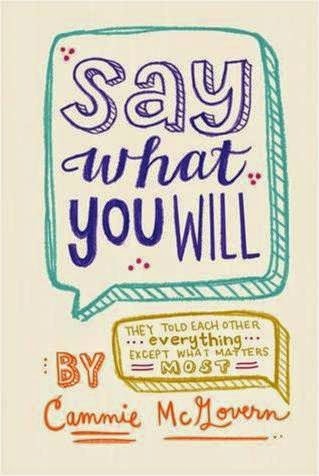 Say What You Will is beautifully written. The novel is about Amy and Matthew. Amy has cerebral palsy. She can't walk well or talk without a voice box, but she is a smart girl with things to say. Matthew is hired to be a peer aid for Amy. He suffers from his own undiagnosed compulsions and anxieties. Amy and Matthew get each other despite their exterior differences. The wonderful thing about Cammie McGovern's book is that she manages to make Amy an absolutely fully formed individual. Amy is gifted, intelligent, and interesting. But, at times, I also found Amy to be really annoying, incredibly naive, and downright cruel. That I could have all these emotions about Amy is testament to how complete of a character she really is. Matthew is perhaps a little less fully formed, and that is a little disappointing. As he started to get better I felt like I lost him a little. Maybe that's okay. Perhaps it's a symbol of how Matthew must have felt as he had to reinvent himself once he started to deal with his disorder. Despite the fact that both Amy and Matthew make painful decisions at times, I loved this journey about two kids claiming themselves and helping each other do so. Say What You Will takes place over the course of almost two years. I enjoyed the slow pace and the time that allowed the characters to grow over time. I loved the play at the end of the book. Plus, the writing is just really, really good. Say What You Will is a book I seem to be seeing everywhere right now. It's being marketed as a great book for fans of Eleanor & Park and The Fault in Our Stars. What's great about Cammie McGovern's book is that while it certainly will be appealing to fans of those hits, it is not trying to be either one of those huge successes. 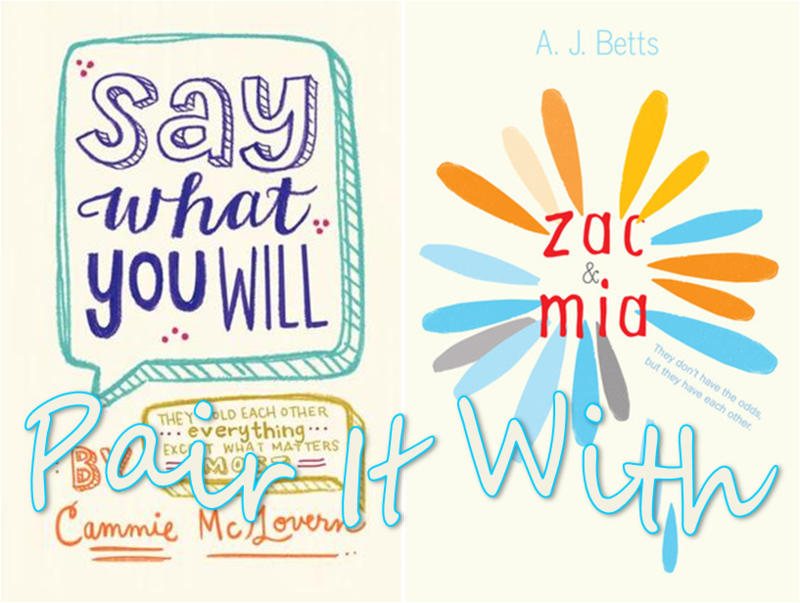 Say What You Will is out June 3rd, 2014. Review copy from Edelweiss. Zac is obsessed with statistics. How likely is it that he will die? How likely is it that this bone marrow transplant will take? Mia is surly and angry. So she runs. She runs into Zac. Trapped in isolation after his bone marrow transplant Zac is fascinated with the new girl next door. He doesn't see many people his age on the cancer ward. So he knocks on the wall, and she taps back. Zac and Mia is about two kids with cancer. It's about two kids who need each other. It's about finding the only person who can get through to you when you've shut everyone else out. I loved the Australian setting. The olive farm where Zac's family lives is particularly wonderful. Zac and Mia was published in Australia in 2012, the same year that The Fault in Our Stars was published in the United States. The comparisons are inevitable, but they are not the same book. The characters are very different. Hazel and Augustus are, at times, in my opinion, a little too smart to be wholly believable. However, Zac and Mia is not as gut-wrenchingly powerful as The Fault in Our Stars. A.J. Betts actually started working on Z and M in 2009. This book was inspired by her work in a children's hospital. For me, that background makes the novel that much sweeter. 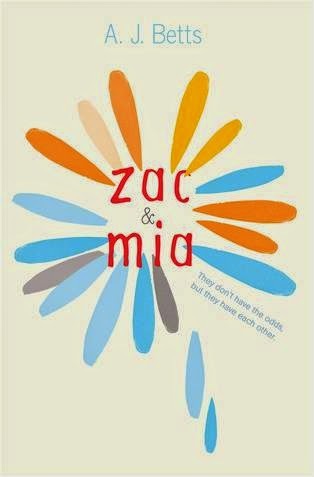 Zac and Mia is out in the United States on September 2nd, 2014. Review copy from Edelweiss.